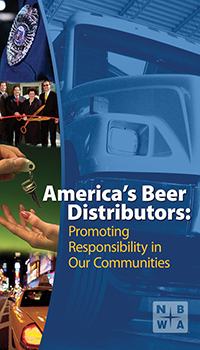 Beer distributors are leaders in their communities and care deeply about promoting the responsible and legal consumption of malt beverage products. Working with their brewer and retailer partners, members of the beer distribution industry play a critical role in the effort to eliminate drunk driving, alcohol abuse and the underage purchase and consumption of alcohol. Beer distributors participate in a wide variety of programs that promote responsible consumption. Programs range from providing free taxi rides home for bar or restaurant patrons to sponsoring alcohol-free after-prom events and producing educational materials to help parents talk to their children about underage drinking. Distributors also promote alcohol education initiatives, such as inviting guest speakers to schools and community centers to share their personal experiences involving alcohol.